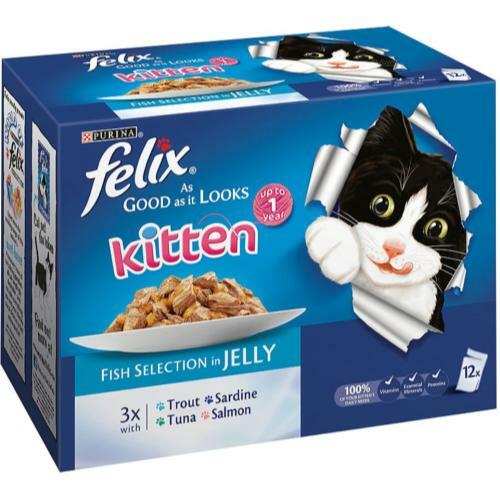 Felix As Good As It Looks’ scrumptious Fish Selection in jelly, formulated especially for kittens (aged 6 to 52 weeks), is so irresistible your tiny ball of fluff won’t be able to wait for the bowl to hit the floor! Despite their mini mouths and teensy tummies, all the growing they've got to do means kittens have voracious appetites! Felix Kitten provides complete nutrition in delicious bite-sized chunks to fuel your tiny terror’s first year of adventures, & made from choice cuts of meat for high digestibility. Individually sealed to keep in the taste cats love, each pouch is a perfect balance of delicious flavour & convenience; just snip it open, pour out the succulent fishy chunks, & let your cat become a Felix cat!